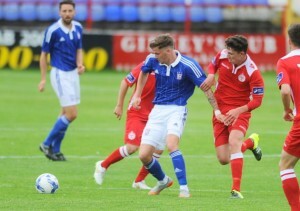 IRELAND Under-19 midfielder Adam McDonnell has been busy making up for lost time during Ipswich Town’s pre-season campaign and hopes to give Mick McCarthy even more food for thought tonight (7.45). The DB Sports Tours client, who joined from Shelbourne last summer, has enjoyed an eye-catching introduction to the senior set-up at Portman Road this month after FIFA red tape resigned him to the training pitch for the best part of a year. A ruling regarding the recruitment of foreign players and academic education meant McDonnell did not receive international clearance to play any games – even at Under-19 or U-21 level – until his 18th birthday in May. Despite the frustrating restrictions, McDonnell has impressed on tour games in Ireland and Germany this month and almost capped a 30-minute cameo in the goalless draw at Peterborough on Saturday night by crashing a long-range effort off the crossbar in the closing minutes. A trip to Colchester is next up for the Tractor Boys tonight as the Championship season approaches and the teenager is out to impress. “I didn’t think that I would be doing this well so quickly – especially after I couldn’t play any games in my first season,” said McDonnell. “When I signed I gave myself a year-and-a-half to impress and move up the ranks, but I worked hard when training with the first team last year and the gaffer (McCarthy) liked me. “The gaffer told me at Christmas that, because of injuries, if I was able to play I would have made my debut, so that was a big boost. The return of Ireland senior internationals Daryl Murphy and David McGoldrick to club duty this week has made competition for places in the Ipswich squad even tougher ahead of tonight’s game. McDonnell admits that the Irish connection at Portman Road have been key to his early impact and is welcoming the competition. “I had been over at Manchester United and Bolton before I signed for Ipswich, but to be honest the Irish lads at the club straight-away made this feel like home. “Obviously, you have the gaffer, a former Ireland manager, but Mark Kennedy is the Under-21 manager too and there is Noel Hunt, Murph (Daryl Murphy) and my room-mate Dylan Connolly (the winger also signed from Shelbourne last summer). “When Hunty (Stephen) was here last season, I used to go over to his house with Noel and Murph for barbecues and they really helped me a lot to settle in and improve my game. “It’s obviously going to get harder to get first-team game time now that all the senior players are coming back from holidays, but that can only make me better, that competition.